The raw food diet glutathione boosting protocol will produce positive benefits for your health and your life in many ways. The increase in glutathione and resulting improved health will cost about the same as you currently spend on food but you will most likely end up eating less. Initially, it would cost a bit more. As you adjust your diet and your health improves the cost should decrease. The more exciting aspect though, what most who embrace it say, it changes their relationship with food. You will fall in love with food and this will be a true pleasure in life, even beyond what it may be for some currently. Note: The raw food diet may not affordable for some simply because of the inability to access healthy food at a reasonable cost. The key to success is moving toward a healthier way of life. Do not go overboard or become fanatical. Just start making baby steps in the direction of best practices. You will be happier if you do. Word of Caution: If you have dysbiosis or are dealing with Lyme disease or Multiple Systemic Infectious Disease Syndrome, your gut may be overtaxed by eating raw foods. In the long run, it will not help you heal. You will need to first steam or lightly cook your vegetables to make them easier to digest. Once gut health is restored, then you can start and enjoy the raw food phenomenon. While supplements can help when facing a health crisis, health maintenance through the raw food diet can help produce a more lasting result. Ideally, once healthy, you will only need very few supplements and most of your nutrition will come from food. The monthly cost of supplements will go toward better quality foods. 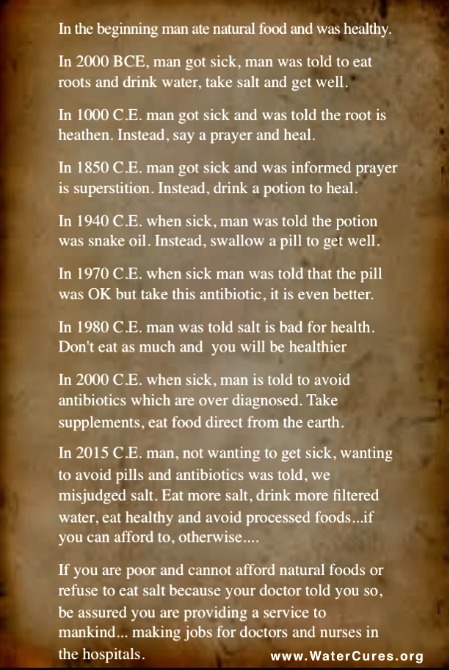 The raw food diet is not new. It is actually the way mankind ate a long time ago. To some extent, mankind has come full circle. Admittedly this is a bit geeky but salt is essential for optimal health. But only the right kind of salt.